After the Eucharistic Prayer, we enter into our celebration of the Communion Rite. This begins with the Lord’s Prayer, the words that Christ himself gave us. Amongst the petitions this prayer makes, we ask God to give us our daily bread, just as we are about to receive the bread that has become the body of Christ. Following the Lord’s Prayer is the Rite of Peace. Just as we are about to partake in the communion which binds us together as one body in Christ, we are reminded in this profound symbol of our unity as the people of God in this community. The profound impact of this symbolic ritual comes when we truly commit ourselves to sharing a sign of peace to all those around us – not just those people who we consider to be our friends. The peace that only Christ can give is offered to all, and the true challenge of the Christian life is to pray that this peace is experienced by all we encounter. After the Rite of Peace is the Fraction (or the Breaking of the Bread). Just as the bread of the last supper was blessed, broken and shared, so too is the consecrated bread and wine that is given to us as a gift. Even though we (and most other parishes) use individual hosts for the sake of practicality, these should be shared out into the patens that are to be used, and a large host should be consecrated that can be broken up and shared amongst some of the gathered assembly. Although it happens in many parishes, the Fraction Rite is not a time to be filling patens with hosts taken from the tabernacle. In fact, the Missal and its introduction (the General Instruction of the Roman Missal) do not make any mention of going to the tabernacle before communion. Rather, the General Instruction makes clear that the communion we receive should have been consecrated at that Mass. 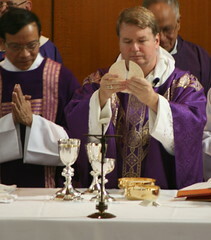 It is most desirable that the faithful, just as the priest himself is bound to do, receive the Lord’s Body from hosts consecrated at the same Mass and that, in the instances when it is permitted, they partake of the chalice, so that even by means of the signs Communion will stand out more clearly as a participation in the sacrifice actually being celebrated.